The start of today’s comic is actually true! Rachel had a surprise bachelorette party and her friends and I knew that she would’ve enjoyed the party less if there was a comic to worry about. So secretly I’ve made a comic using my art forgery skills. We’re getting married this Friday but Rachel has told me there will be an update next week (she’s really serious about giving you a comic each week!). 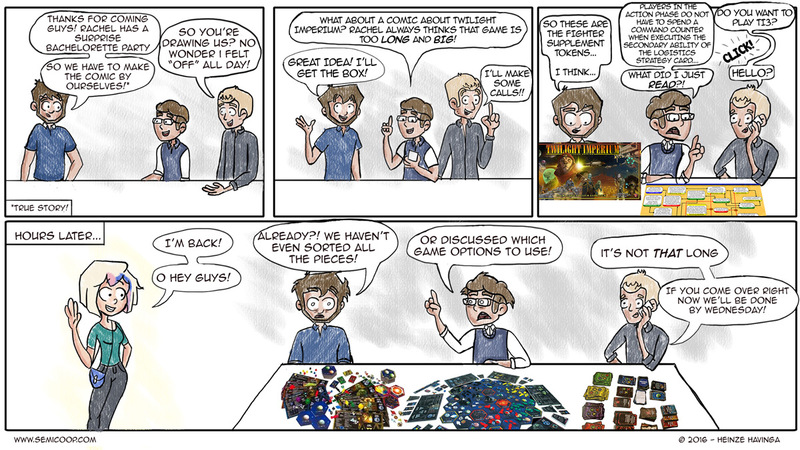 The game in the comic is an actual game and although we’ve never played it, the comic doesn’t seem to stray too far from reality. Twilight Imperium 3rd edition is a game that comes in a huge box, has a ridiculous play-time and comes with endless amounts of plastic ships, cards and tokens. In the game you control a interstellar race trying to build a galactic empire through trading, politics and combat. It’s one of those lovely decadent impractical games that lures me like a moth to an all consuming flame. I hope to get to play it one day because it’s such generator of great stories. Ars Technica wrote about it just this weekend and Shut Up and Sitdown (congrats to Quintin and Leigh for getting married as well!) have done a very fun playthrough video about it. And even though it seems like such a blast, I have no intention of ever owning it. One of our friends sold it off because he never got to play it, and I think our copy would suffer that same fate. Rachel is reluctant about getting into games that take longer than 6 hours (the nerve!) and I’ve come to realise war-like game are something that can force you into a tiny corner of the map without giving you a lot of options to get back into the game, which will ruin the fun that player will have. But if anybody would invite me to a game I won’t say no (wink wink). What game would you love to try, but would never buy? And because of which reasons? TI3, a lovely game! Yes it’s long, but it’s also very rich and deep gameplay. I recognise the pain going through all the play variants, what options to use, etc. But still its a great game! Played this every few weeks for a time, and you could really get into some new and challenging tactics to win the game that way. My only game of diplomacy (with meal breaks and sleep) lasted 24 hours, it’s crazy long. But Diplomacy is fascinating because it’s so simple in its rules, the game is mostly a framework for a lot of social interaction. But I think I had my fill with that one time, or maybe I can be persuaded to a play by mail game. Star Wars rebellion, the big game of thrones game from fantasy flight and twilight imperium. Generally actually all those kind of games. I would really want to try but I’m not going to buy them because the cost won’t justify the table time it gets and the time investment needed to play it. Congratulations on your upcoming marriage as well. An option is to buy such big games with the group you’re planning to play it with and to divide the costs. But I guess that’s only an option if you have a group of people you play games with on a regular basis. Revolution: The Dutch revolt is the game I needed to have, but haven’t been able to play yet. It doesn’t seem to take that long, but it is very hard to get my family interested in it. We play Ti3 about 2-3 times a year, except this year mostly just due to having to study for a crazy test all year. It’s a fantastic game and really if you get over the hurdle of playing it once (it’s 10x easier if someone can teach you it) you can have a ton of fun with it. There are entire communities out there around redoing rules to tweak the game even more it’s amazing. The biggest thing is just plan it like a month out so you all can set aside the time to play it. I attended an epic board game day where all games being taught were 4+ hours long. I and 4 or 5 other newbies sat down at 10am to learn TI3 from a couple veterans and we finished around 7pm. It was actually a lot of fun, you just have to know what you’re getting into and plan a whole day (order pizza, stay hydrated). I avoid starting down the road of purchasing games that have 5 or more “necessary” expansions. I’m too much of a completionist and don’t have the money. We actually own a copy of android but have only played it once, and even then we only made it to the halfway point. After three hours our guests decided they were done. I love all the bits to pop out and sort for games like this and my husband is excellent at translating long, complicated instructions into more pain English for the rest of us. We’re actually hoping to convince enough people to come play with us to get a game in sometime before year’s end when the baby is due. Best wishes for a lovely wedding and a long, happy, game-filled marriage! CONGRATULATIONS, GUYS! So happy for you, and so impressed that you’re still putting out comics literally days before the wedding. Have a great day.